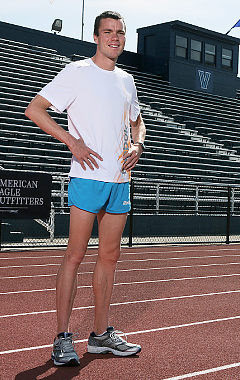 Villanova Running: Curtis Flying Under the Radar at NYC Marathon? Competitor.com contributor Duncan Larkin went on a run with top American Bobby Curtis just a few days before Sunday’s ING New York City Marathon. He shares his experience with the soft-spoken marathon debutant in this exclusive first-person piece. Bobby Curtis doesn’t exactly stand out in a hotel lobby, especially that of the New York City Hilton on Sixth Avenue, a place where hundreds of runners–including the top elites–stay when they’re in town for the ING New York City Marathon. It’s convenient location is but a short jog to the finish line in iconic Central Park. This lobby is a spot where someone like Emmanuel Mutai, the fastest marathoner in history, could be standing in the concierge line next to Joe Marathoner -– or the likes of defending champion, Gebre Gebremariam. But I recognized Curtis, with a lean look and fit frame distinguishing him from the masses scattered about the room. Curtis, one of the top American runners at this year’s race, sauntered over to me. We had originally agreed to meet at 2 p.m. I was a bit late; he was right on time. Bobby was wearing Reebok trainers and in his hands he held a pair of racing flats. There were five days until the big race in The Big Apple, which would be Curtis’ marathon debut. He didn’t look that nervous. “Are you OK with a few miles jog?” he asked me. I was. But I wasn’t OK with what was in store after that: two to three miles at 5:00-per-mile, his race pace. “I’ll sit on a bench while you do that part,” I told him. While we jogged down New York’s cavernous avenues on the way to Central Park, I asked Bobby about Sunday’s upcoming endeavor. He shrugged. Bobby is a laid-back guy and so he shrugs a lot. “So are you self-coached, then?” I ask. Bobby shakes his head and proceeds to tell me about Nic Bideau. “Nic”, an Australian who helped coach Cathy Freeman to an Olympic gold medal in the 400m and 5,000-meter man Craig Mottram to his Commonwealth Games silver, is Bobby’s official coach. It was O’Sullivan who introduced Curtis to Bideau. By that point we reach the part of Central Park where Bobby will head off for his solitary race-pace miles and I will sit on a bench and wait for him. He takes off his long-sleeved shirt and begins a series of odd-looking stretches. I ask him his philosophy on stretching. “I like stretches that will give me a quick result,” he says while crouching down, raising his hands in the air, and then suddenly dropping them like a sumo wrestler. At that point, Curtis stands up straight, dons his flats, taps his watch, and takes off down the gravelly bridle path. After 30 minutes, he returns, breathing normally. A small pool of sweat has formed under his arms, but that’s the only visible sign of his efforts. “Did anyone recognize you out there?” I ask. On our run back to his hotel, I ask Bobby about what it means to him to be running through America’s largest city, a city of eight million people, as one of the fastest prospects, and possibly the top American on Sunday. “C’mon, Bobby, you are living the dream, right?” I ask. I ask him what it means to be a professional American long-distance runner on the brink of his big debut–if he’s feeling any extra pressure to perform well in his first go at racing 26.2 miles. I remind him of the Letsrun.com peanut gallery. We reach the end of Central Park and stop running. Soon, we reach the hotel lobby. Bobby shakes my hand and I wish him luck as he disappears into the elevator.